Remember last year when Nokia released the Lumia 920 and they just wouldn’t shut up about the new PureView camera? They even put out a video to show off how good it was at optical image stabilization and wow, was it good! Oh yeah, it was also faked. If you look closely at 27 seconds in, not only is this video being shot from a box van driving next to the girl, shot by someone else from a bicycle, as it implies, it is also being shot with a full DSLR video rig. 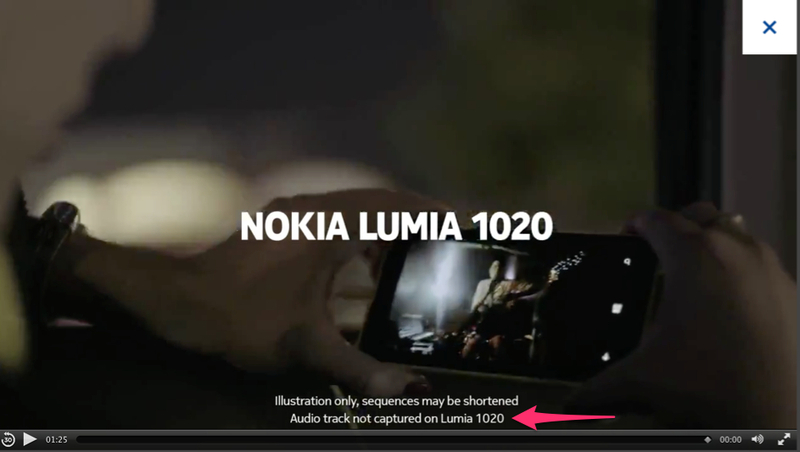 Turns out the Nokia Lumia 920 video was actually shot with a DSLR, not with the PureView camera with optical image stabilization (OIS). Nokia eventually released an apology but kept playing the ads. Today Nokia announced the Nokia Lumia 1020 with a massive megapixel count of 41 in its latest generation of the PureView camera. They put out lots of specs about the camera and its ability to capture great photos even in low light conditions. With as many megapixels as you have there (5x the resolution of an iPhone 5) anything is going to look amazing on a small screen. It’s native print size would be 18×26 inches which is huge. However, Nokia is back to their old games. This time it’s misleading marketing of the camera’s ability to record audio even in loud environments. Anyone who’s been “that guy” that records video at concerts with their cellphone can attest how horrible the audio ends up. If this camera can not only capture the low light video as beautifully as it claims and record “great” audio, wow, just wow. So we click the video and hear audio that is amazing. Like really good. So good that I even looked up the artist featured in the advertisement. It’s Karin Park and the song is called Explosions. You should give it a listen. Oh but seriously, listen to it. See, the reason it sounds so good is because it wasn’t actually recorded with the Nokia Lumia 1020. It was recorded in a studio with proper studio equipment. At least this time around, if you watch to the end and look really carefully, Nokia admits ahead of time that the feature they are advertising, awesome sound quality even in loud environments like concerts, is fake. Maybe I’m being too picky here, but if the last time you released a PureView camera you made such a big deal about a selling-point feature that turned out to be faked in your marketing materials, the next time around, let’s try to be a little more honest. If it is awesome at doing what you claim it is then show us. Don’t simulate it. It makes us question everything else. Look, I know just about everyone does this sort of stuff but it doesn’t make it OK. At least Nokia put in a disclaimer saying the rich audio recording in loud environments, like a concert, with the Nokia Lumia 1020 was not actually a rich audio recording in a loud environment. But seriously, just shoot something with rich audio in a loud environment if you say it can do it. Heck, hire professionals to do the entire thing with the Nokia Lumia 1020. We’d rather know what your phone can do than what a recording studio can do. 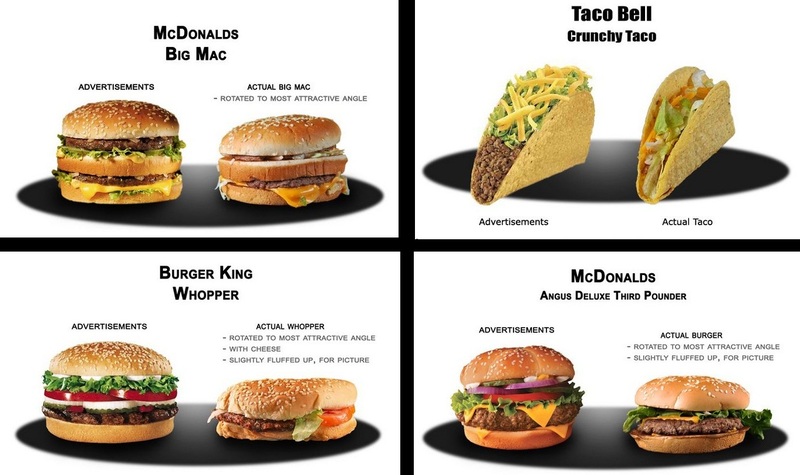 Restaurants simulate food in advertising all the time and it annoys us. At least in that case we can’t taste the advertisement and expect the same results when we get one of own. Though one might argue that a paper Big Mac tastes better than the real deal. This entry was posted in Life, Nerdiness, Rant, Thoughts, Video and tagged 41mp camera phone, Big Mac, Camera, Image stabilization, iPhone 5, Karin Park, Nokia, Nokia Lumia, Nokia Lumia 1020, Nokia Lumia 920, Nokia Lumia 920 Fake, Nokia Lumia audio recording, Nokia scandal, PureView, PureView camera quality, Windows Phone by Justin Scott. Bookmark the permalink.